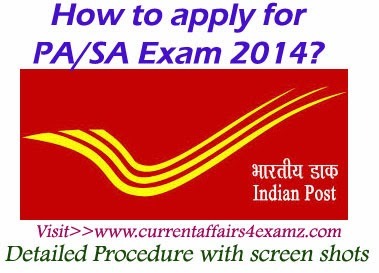 Friends..Application submission for Postal/Sorting Assistant (PA/SA) Exam 2014 started on 26 February 2014. Applications are to be submitted online. Candidates have to visit the website www.pasadrexam2014.in for submitting online applications. For your help in this post, we are bringing you the detailed procedure for submitting the application online along with screen shots. This will certainly help you applying without any doubts. (This time application procedure has been made very simple. In most cases you have to just select credentials from the drop down menu available). 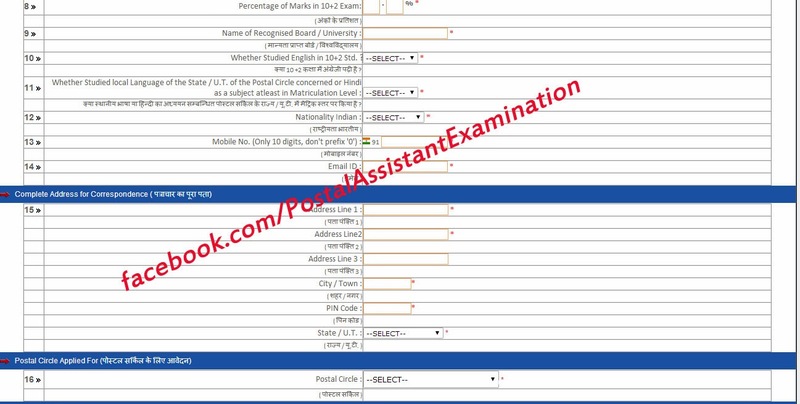 Note: Before starting feeding of inputs the applicant should be ready with the Percentage of marks scored in qualifying 10+2/12th class up to two decimals and Year of passing, Date of birth, soft copies of passport size Photo (in size of 10KB to 20 KB in .jpg/jpeg format) and scanned Signature (in size of 5KB to 10 KB in .jpg/jpeg format) which are required to be uploaded after filling up of the inputs and uploading the application on-line. >> The applicant has to use an Internet enabled work station, personal computer/laptop and should open the website www.pasadrexam2014.in to find the link “CLICK HERE TO APPLY” on the home page for Registration of On-line Application. Step1: Tick the box (I have read Advertisement....). Click on "Click Here to Apply"
Step2: You will be prompted to another page where you have to enter the following details. 10) Whether Studied English in 10+2 Std. 18) A total of 10 preference will be asked. 19) A total of 03 preferences will be asked. (G) Declaration: Declarations as given the application form have to be undertaken. Step 3: Click Save Data. Now a message will be shown as follows " Your Data Saved successfully. Please upload Photo and Signature." Step 4: Click on the button Upload Photo/Sign situated near the button "Save Data" as shown in Screen Shot. A pop up box will open (If pop up is blocked click on the box and enable it). A screen as shown in the below screen shot appears. SIGNATURE– Signature of Applicant. A sharp scanned copy of recent Signature is to be Uploaded in jpg/jpeg format of size not more than 10KB. The Applicant's signature shall be used for the official record and during the Examination process. In case there is a variation in the Signature at the time of Examination in Paper I/II candidate is not allowed to take the examination. Step 5: Select Photo and Signature and click Upload button. If you follow the correct specification a message showing successful upload of Photo & Signature will come. Step 6: Now you will again come to the earlier page where details have been entered. Now click on "Preview" button available near "Upload Photo/Sign" button. When you click on that, a sheet showing the details you entered along with your Photo and Signature will appear. If he/she wants to change, he can go back and make required changes and Save once again. He/she can once again see Preview and only after he/she is satisfied can finally presses SUBMIT button. It is mandatory for the applicant to see that his/her PHOTO & SIGNATURE are seen with good clarity and fits into the boxes given in the PREVIEW. If PHOTO / SIGNATURE are found to be blurred or smaller /bigger than the box at the later stage its application & his/her candidature will be cancelled without any communication and no FEE will be refunded. Step 7: If all details are correct now it is time to submit the application. Click on Submit button. Step 8: This button finally saves the application. Please note that no changes in the Application Data will be permitted after this stage. Applicant is Prompted with the message “Registration has been done successfully” and (a Unique) Registration Number is generated for the application. This Registration Number along with a Password is sent to applicant’s email ID and also through a SMS on Applicant’s Mobile for future login and references. If applicant is not getting email, please check the Junk email/ SPAM too in the email account. Step 9: After successfully submitting the application, the following LOGIN page will appear. You can log in using the Registration Number and Password provided. Step 10: On successful LOGIN the following page will appear where he/she finds the links PRINT CHALLAN TO PAY FEE, CHECK PAYMENT STATUS & PRINT REGISTRATION SLIP. Step 11: Click on Print Challan to generate challan for payment of fees. On clicking link for “PRINT CHALLAN TO PAY FEE” applicant generates FEE Challan needed to pay FEE. It has to be printed using a Laserjet or Inkjet printer ONLY on an A4 size sheet. The screen shot of the challan is shown below. Step 12: Go to ePayment Post office to Pay Fee. 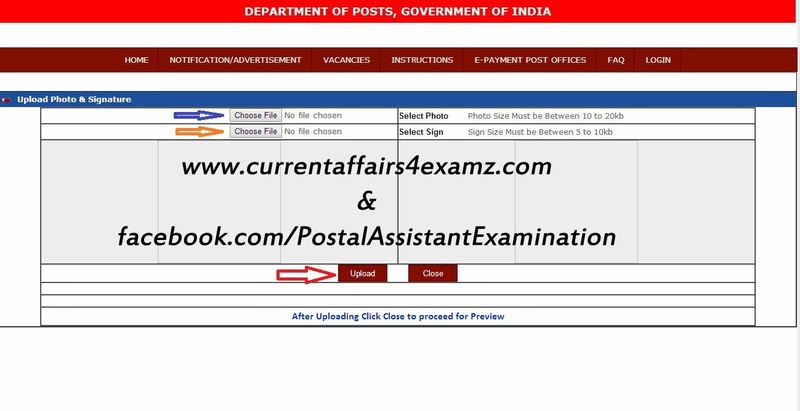 (Click Here to see name of ePayment Post Offices). 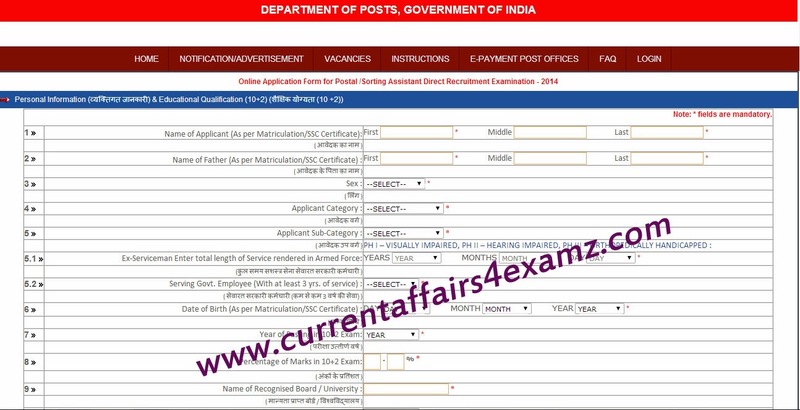 Applicant is required to carry hardcopy printout of FEE CHALLAN (Three copies one A4 sheet) to one of the ePayment Post Offices and pay FEE in CASH. The sheet contains Three copies of challan. Two copies will be collected by the Counter and applicant can retain Applicant’s Copy for future reference. On payment of FEE in CASH Applicant will get a paper RECEIPT which is also to be retained for future reference. 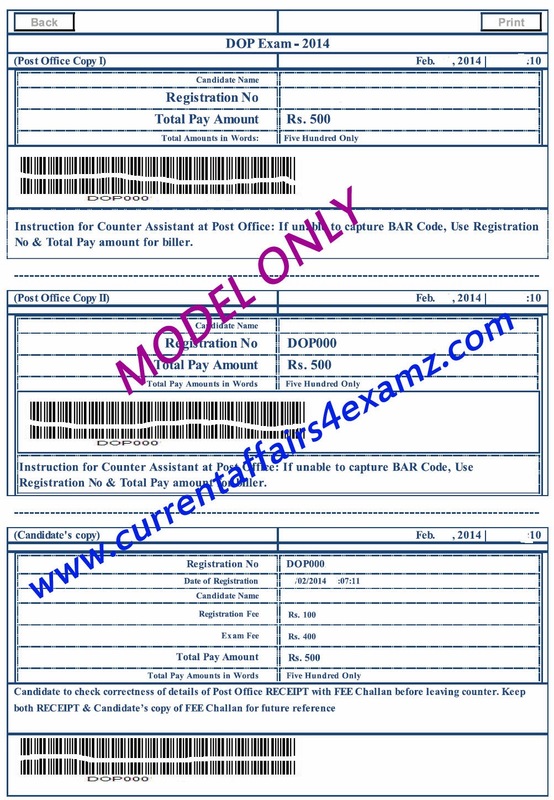 Before leaving Counter, Applicant is required to match Registration details printed on the RECEIPT with FEE CHALLAN for its correctness. Step 13: Login and Check payment status. For checking the “Payment Status” Applicant is to LOGIN after 3 days. 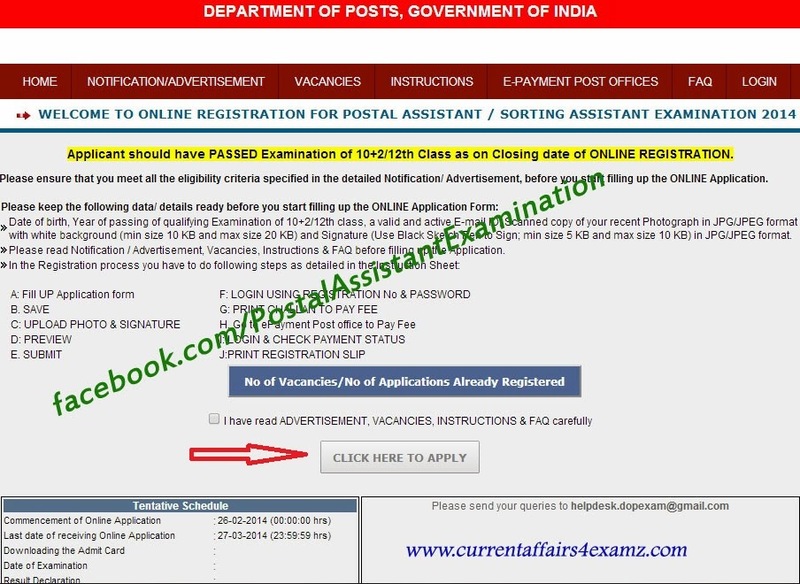 If your payment till then has not been reflected in the Registration System, to do enquiry applicant can send a query on the email ID helpdesk.dopexam@gmail.com. If Payment Status is “Paid” you may proceed to next for printing of Registration Slip. Step 14: Print Registration Slip. On getting status of “You have PAID the FEE”, applicant is required to print REGISTRATION SLIP for future reference. WITH THIS REGISTRATION PROCESS COMPLETES. 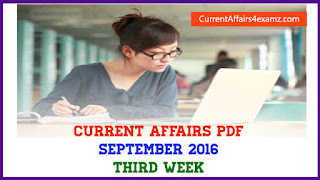 Bookmark and Visit our blog regularly for all latest update relating to PA/SA Exam. You can also join our exclusive facebook page. Click Here to join. can we apply for more than one post?...or we have to just select PAPO? U can apply for more than one post as per your wish in order of preference..
Hi sir. Within howmany days we should pay the fee after registration sir. I hav applied on march 6th can I pay fee on march 10th sir.. If time is over and didt psy the fee. Can I applynagain with different mail id and phone number and can I apply n pay fee sir..
Pls do reply for my query . Soon sir..